Gently stir the cheesecake, crust and all, in a stand mixer fitter with the paddle attachment, or by hand with a spatula, until the crust has mixed with the filling. Use a small ice cream scoop or melon baler to scoop 1-inch balls of cheesecake an roll them in your hands to shape more precisely. Insert a lollipop stick into the cheesecake and place on a parchment lined baking tray (if the cheesecake mixture seems too soft, you can freeze the scooped balls for 30 minutes before shaping and inserting the sticks). Freeze the pops for an hour, while preparing the chocolate and accents. 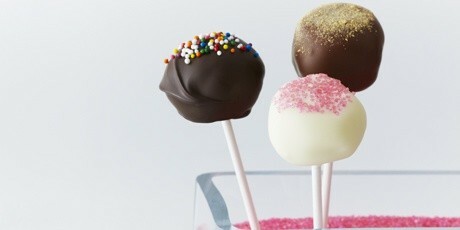 Dip the pops in your choice of chocolates and then dip or sprinkle the accents on at your choosing. 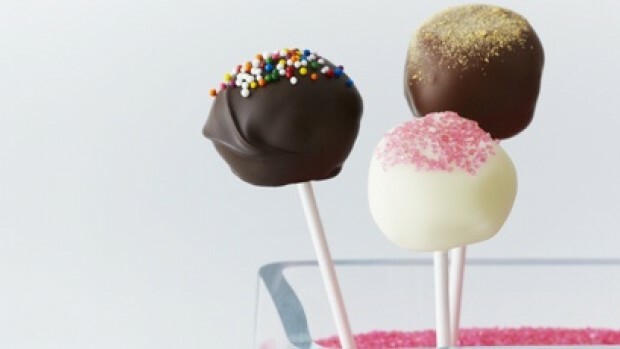 For presentation, arrange the dipped and decorated pops in a vase filled with coloured sugar, or in a lollipop stand (available at kitchen supply stores).